Around the world, plant populations are distributed with poetic symmetry. A single species can be traced back to a geographical center of origin, but across the globe might be home to many close relatives. Over millions of years, populations spread across diverse continents, and in turn, diverged from common ancestry. The fittest plant species survived in harmony among stressful climates, virulent diseases, and devious insect pests. For some, traits of durability and resistance became galvanized within their genetic code. In modern New England, many urban and natural forests are plagued by invasive species, stirred up by anthropomorphic behavior. These organisms - which mainly take the form of insects, fungi, viruses, and bacteria - can invade and completely outwit our North American natives. Within the last century, we have lost valuable species like the American elm to non-indigenous pests. Today, conservationists place value on plants that have co-evolved with significant pests and study their genetic diversity. From them, we may better understand co-evolutionary relationships and their associated strategies of resistance. Species are conserved all around the world outside of their native environment for a variety of purposes. Known as ex-situ conservation – or “off-site” conservation - plants are cultivated and preserved in managed landscapes for interests including research, education, and gene preservation (BGCI). Living conditions such as temperature and precipitation must be analogous to the native climate of the target taxa, especially if growing outside the country of origin. Individuals that exemplify pest-resistance and climate-resilience are highly desired for use in sustainable forest management. From these plant resources, we can breed for resistance genes and attempt to restore wild populations or even introduce exceptional cultivars into commercial nurseries. These can be powerful strategies to help stabilize our dynamic landscapes. One of the strategies used to fuel ex-situ conservation is the stewardship of botanical gardens and arboreta. Like collections of a museum, specimens are meticulously documented and maintained for their seed, pollen, tissue, and other vegetative parts (BGCI). Many botanical gardens often take shape within historic properties, urban tree collections, and college campuses. Founders of UMass Amherst, which was first known as the Massachusetts Agricultural College (MAC), designed the campus as a landscape for learning. Their intention for MAC was to be a western template for scientific agriculture and horticulture. Western explorers of the 19th century traversed unfamiliar lands to collect seed to be planted at home. Japanese educators were very interested in MAC and communicated so by sending hundreds of seeds as gifts and coordinating exchange students from Japan to help garner this professional relationship (Special Collections and University Archives). In 1876, William Smith Clark, the MAC’s third president, had been contracted to establish an agricultural college at Sapporo, Japan on the island of Hokkaido. His academic focus in plant physiology attracted him to the many interesting and ornamental plants of Japan. He was joined by William Penn Brooks, William Wheeler, and David P. Penhallow. Brooks, who introduced corn, beans, and onions to Japan, also sought to discover its unique plant life. Much of this plant material was first sent to and propagated by the Arnold Arboretum of Harvard University - an institution founded on the wild collection of temperate woody plants. Vegetative cuttings and seeds from these specimens were soon shared with the MAC (Searcy and D'Acunto, 2009). The Durfee Garden and Rhododendron Garden became the first two ornamental landscapes of the Amherst campus, in contrast to its sprawling agricultural fields that then engulfed the campus grounds (Tristan, 1992). These gardens are still home to several original specimens and symbolize our historical commitment to international education. Since 1944, the contiguous campus grounds have been officially recognized as the Waugh Arboretum, named after the head of the landscape architecture department, Frank A. Waugh (Larson, 2009). Over the decades, the arboretum has preserved its heritage and worked to define thematic landscapes that reflect the UMass identity. Influences of Japanese culture can be traced throughout the landscape, now including dozens of species native to Japan. Looking deeper, I found an uncanny parallel between the ancient Japanese concept of wa (和) and our campus arboretum. This term, which literally translates to “harmony”, portrays a moral code that rewards social cooperation over the self. This spirit has origins in early agriculture, military, and business, where resource-sharing was paramount to survival (Hoffman, 2016). The idea of wa is a useful compass for how modern societies must interact with their landscapes in our undoubtedly unbalanced world. Generations of conservationists have devoted their careers to protect species whose native habitats have been threatened or destroyed. In the refuge of public horticulture, these organisms can live on and inspire wa for generations to come. The wa logograph, depicted above, has a mystic resemblance to the champion Japanese elm standing beside old South College. At its core, UMass has maintained the balance of green and built environments. Grown from seeds from Japan in 1890 by Professor William Penn Brooks. The Japanese elm is the first of its species on American soil and became the class tree of 1899. This tree is located on the corner of South College, within the campus core. A protective fence surrounding the canopy dripline ensures its root system is left undisturbed during campus development or foot traffic. 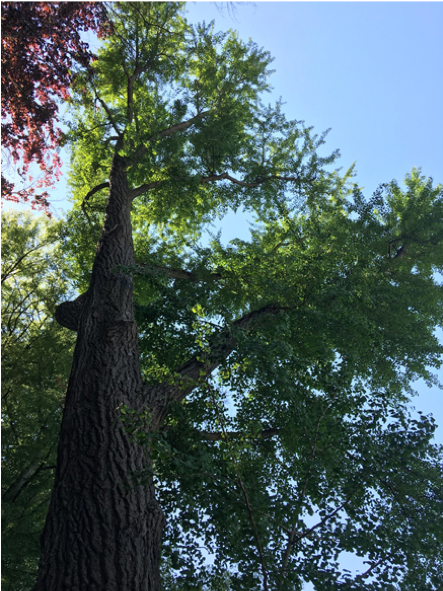 Unlike the American elm, this Japanese species is resistant to Dutch elm disease. This is the result of co-evolution with the disease-causing fungi. The ginkgo tree stands tall in Durfee Garden as one of the original plantings. The Ginkgo species was crowned by Charles Darwin as a “living fossil”. Its lineage dates back 250 million years, with no surviving relatives. It has dominated geological periods from the Jurassic to the Ice Age. This exceptionally durable tree has been searched to exhaustion in the wilderness of China, Japan, and Korea. Plant explorers conclude it exists now only under the protection of urban gardens, parks, and streets. It has been documented that the Rhododendron Garden once featured Japanese maples from the 1870’s, collected at the base of Mt. Fuji. Although none of those specimens remain, several trees of that era can be seen throughout the landscape of the Chancellor’s House. In a letter to his wife from 1880, William Penn Brooks was said to have made syrup and sugar from the sap of this species. Planted on either side of the Rhododendron Garden, these twin umbrella pines are of impressive stature. These two trees were grown from seeds sent to MAC from Japan by President William S. Clark in 1877. The specimen featured in the photo is recognized as the National Champion of its species. The Sakhalin corktree grows isolated on Sakhalin Island and northern Japan. The common name references its outer layer of cork and is the hardiest of the Phellodendron genus. There are two specimens living north of Munson Hall, in the campus core. One of the two is the Class Tree of 1901 and Champion of its species. Located on the western side of the University Club are two original plantings of the Japanese tree lilac. One has been recently nominated as a National Champion Tree, the other not far behind. These highly ornamental specimens were raised from seed collected in 1876 by William Smith Clark, who also sent material to the Arnold Arboretum for introduction. 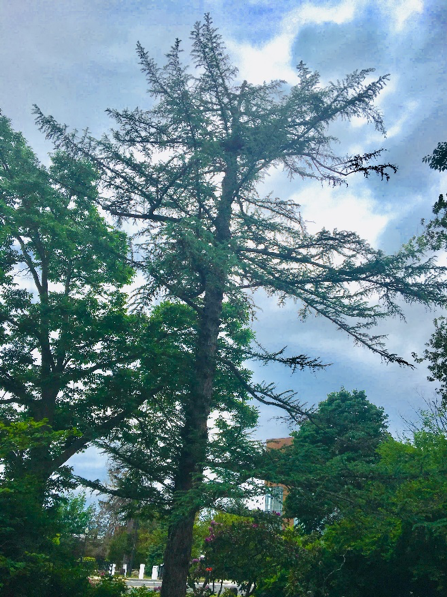 Designated a Champion tree in 1974, this Japanese larch stands tall in the southwest corner of the Rhododendron Garden. Arnold Arboretum of Harvard University. (June 19, 1912). Bullet No. 27. Jamaica Plain, Massachusetts. Larson, Joseph S. (March 5, 2009). The Waugh Arboretum, University of Massachusetts, Amherst. Tristan, J. (1992). A history of the Durfee Conservatory: University of Massachusetts at Amherst 1867-1992. Amherst, MA: Sara Pub.